FUKUYAMA, Japan (AP) — It’s a sunny summer morning in the city of Hiroshima, Japan. Cicadas chirp in the trees. A lone plane flies high overhead. Then a flash of light, followed by a loud blast. Buildings are flattened and smoke rises from crackling fires under a darkened sky. 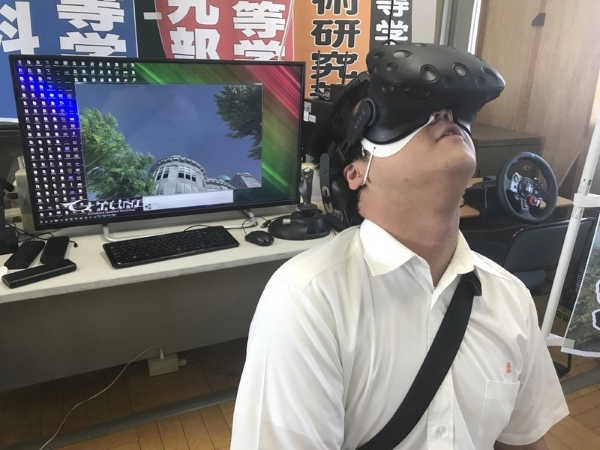 Wearing virtual reality headsets, users can take a walk along the Motoyasu River prior to the blast and see the businesses and buildings that once stood. They can enter the post office and the Shima Hospital courtyard, where the skeletal remains of a building now known as the Atomic Bomb Dome stand on the river’s banks, a testament to what happened. The students, who belong to the computation skill research club at Fukuyama Technical High School, were born more than half a century after the bombing. Yuhi Nakagawa, 18, said he initially didn’t have much interest in what happened when the bombs were dropped; if anything, it was a topic he had avoided. The students are working through summer vacation in a classroom without air conditioning, as temperatures reach 35 degrees Celsius (95 degrees Fahrenheit). With the survivors aging, Hasegawa said, it’s a race against time.